Cutting It Straight 2017 | Women’s Track | H.B. Charles Jr. When Cutting It Straight (CIS) began, we offered one class for women on Biblical Womanhood. Last year, by the leading of the Holy Spirit we added the Women’s Track to the conference to minister to, equip, and encourage women. The Women’s track is designed for women who have the responsibility of teaching the Bible regularly and leading other women, including pastors’ wives, women’s ministry leaders, Sunday school teachers, and small group facilitators. 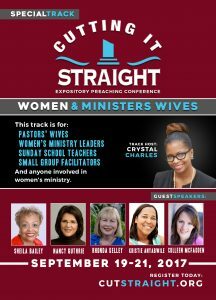 Just as the conference is committed to expositional preaching, the Women’s Track is committed to emphasizing and lifting the standard for expository teaching in settings for women. In Titus 2, Paul acknowledges that women teaching the bible to other women is necessary and healthy for the body of Christ. Therefore, women in a teaching ministry must rightly handle the Scriptures or “cut it straight” so when teaching they state what the sacred texts says, what it means, and apply it to life because “All scripture is breathed out by God and profitable for teaching, for reproof, for correction, and training in righteousness” ( 2 Tim. 3:16). This year we are pleased to have Kristie Anyabwile, Sheila Bailey, Nancy Guthrie, Rhonda Kelley, and Colleen McFadden share with us. Collectively, these bible teachers have decades of experience ministering to women through their teaching ministries, books, and writings. They will instruct in a way of reading, understanding, and teaching the Bible by surveying Old and New Testament books to give women a foundation or further their skill with expository teaching.